Who are the true worshippers? God has NO birthdate! God told me to make sure I’m clean inside. Jesus made this possible. I need Jesus to wash me. I had to search myself and see if there were things in me not pleasing to God and ask Jesus to forgive me. I looked around in my mind and heart to see if I had a bad attitude towards someone. I asked the Holy Spirit to reveal anything in me not pleasing to my God. GOD IS HOLY! I’m learning more and more about His Holiness and why I needed a Savior and why I need to live a holy life. My Father the creator is HOLY and He HATES SIN! I don’t want to be dirty spiritually. Cleanse me with hyssop, and I will be clean; wash me, and I will be whiter than snow. Wash me Lord! Cleanse me with hyssop, and I will be clean; wash me, and I will be whiter than snow. In Jesus name. The Holy Spirit will help you with this and Jesus will wash you when you sincerely come to Him with a repentant heart and ask in His name to be forgiven and cleaned. Hey, i have recently decided to get serious with seeking the lord. I also recently found out how important it was to get filled with the holy spirit. To tell you the truth i was was sort of scared of him for a while. i went through a whole spiel of thinking i had committed the unpardonable sin and all that and im still a bit reluctant to gt filled because i don’t want to think something wrong and grieve the spirit and im just and anxious anxiety ridden person and also just generally afraid of the unknown. though im reading my bible and studying the word and hoping my faith grows so big that i can completely give myself to the lord and not let my fears and low self esteem affect me. Anyways, i had 2 dreams i would like to share. in one dream i was talking to someone i know and we were in this old crummy apartment building and i was complaining about how it sucked and how i had to live there and the person just said ” you have to release to God, your at the edge of breakthrough but you had to release to God” and then i had another dream where i was pregnant and i would soon deliver my baby and i was happy and my mother called my father and told him to tell me to make myself clean…it was really odd. Do you have any insight. Hello. Do not fear the Holy Spirit. He is very patient and kind and loving. He would never do anything to scare anyone. Also as you study the word of God it will teach you and help you in all you need to know about who God is and this will help you with your fears about God and what God expects of you. I believe your first dream is clear and God does want you to release your will to God and submit to His Son Jesus Christ. The second dream was just a dream. God is clean when He gives you a dream. He doesn’t leave you hanging with a non understandable dream. There is no purpose in that. There is never any reason to be scared of Gods ways…unless one is a sinner. Even then God is merciful and offers salvation and healing. Be patient with yourself and know who God is. Talk to Him a lot and let Him talk to you. God bless you and keep you! Tanya, you have selected one of my favourite verses in Psalm 51. Indeed, whenever I read the whole chapter, this particular verse brings a lump to my throat, and I nearly always shed a tear. When you get the chance, please read my very last blog post which is also about inner cleansing. Great blog about the window cleaner. Girl…you have a window cleaner? LOL! I need one! Spiritually I’ve got one who points out the streaks…the Holy Spirit. Amen! Holy Spirit, please point out those things in me that displease God so I can repent and be cleansed. Amen. Yes Lord! The best prayer one can pray! God bless you! Amen I agree Lord cleanse me. I need to be cleansed…I have to because I’m a prayer intercessor and I need to be in a right place for the Lord to hear my prayers. The prayers of a righteous man avails much. Lord forgive me…cleanse me! Wash me. Thank you Jesus for the blood! wonderful post! I was completely nurtured spiritually. God is so good….God bless you! 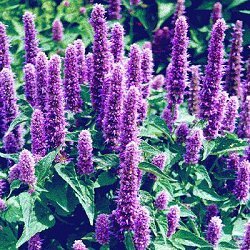 I never knew what hyssop looked like! You’d have thought I’d have Googled it by now, but it never crossed my mind. I wasn’t aware it was so lovely — somehow, I just thought of it as a brown bunch of flimsy twigs. That lavender color is gorgeous — thanks for educating me this morning! I had to do research for this blog and I was surprised to see the beauty. Only God would be so creative. Writing a blog is good for me in so many ways.